Universal Religion Maiism . 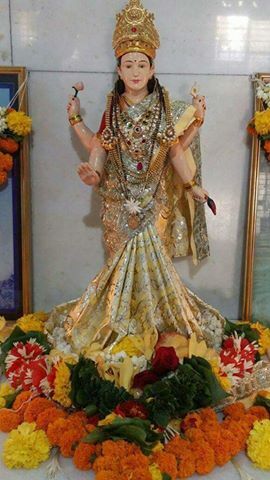 Jay Mai Jay Markand Mai. Those who get a glimpse of Mother, first see such a flood of light, that the eyes close down as on the sudden appearance of sunlight in dark and the devotee falls in a swoon for a few seconds. She is single and devoid of all attributes, perfect, complete and not subject to any modifications. Mysterious are the ways of Mother. Just mark the contrast, She is comprehensible and knowable as broad day light as meant by the name Prakataakrutih, and yet, Guhyaa, most incomprehensible. By now, the reader must be able to explain the contradiction. To them whom She chooses is knowable; to them from whom She wishes to conceal Herself She is Guhyaa; but the last word is that She is Guhyaa. Kaivalya is the state of consciousness of singleness without attributes. Kaivalya is the establishment of the energy of consciousness in its own nature, in which condition all sorts of modifications are extinct. Kaivalya is the stage beyond the four popularly known classes of salvation. Pada means salvation. 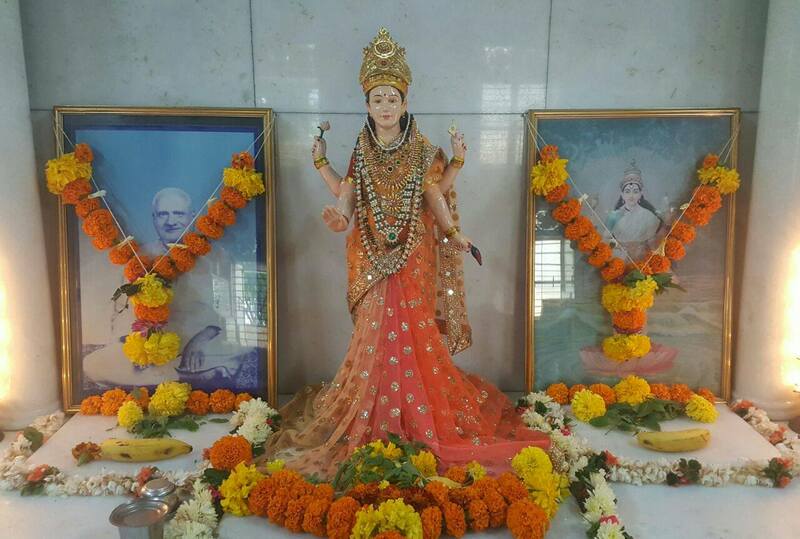 The four classes of salvation are Saalokya सालोक्य, Saarupya सारूप्य, Saamipya सामीप्य , and Saayujya सायुज्य. 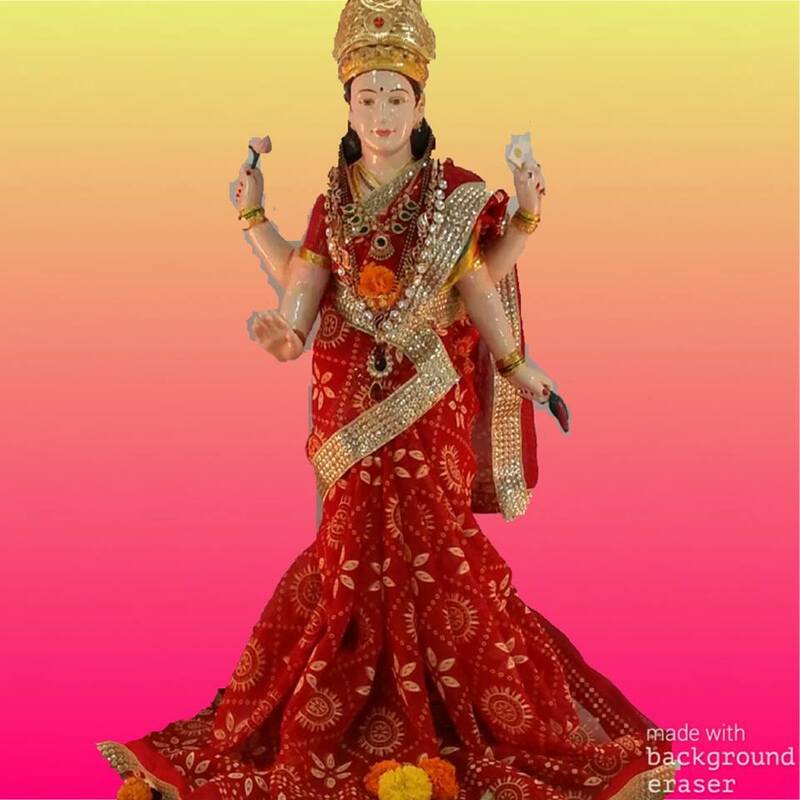 The Saalokya सालोक्य means remaining with Mother in the same world and is the state to be attained by the worship of the mass type. Saarupya सारूप्य ( receiving the same form as Mother’s). 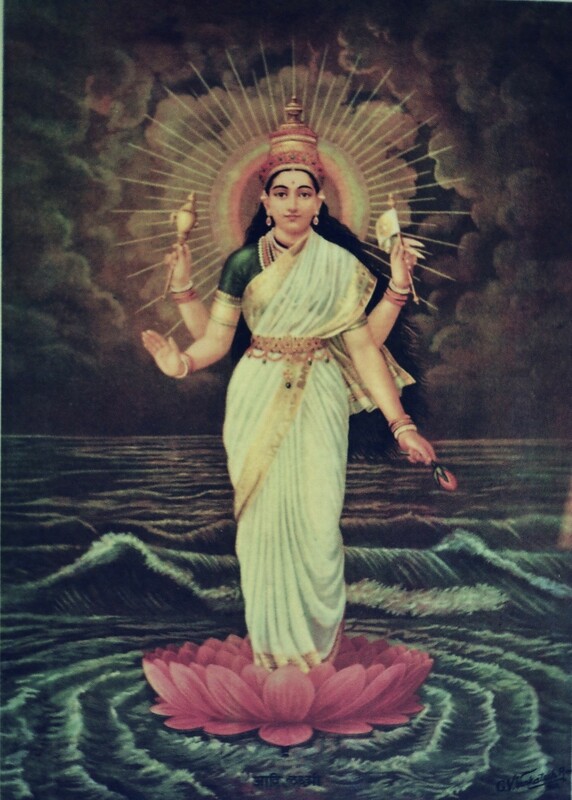 This is the result of the worship, without any show of it without using images.Here, the deities are regarded as different from oneself, although the worshippers are of course endowed with dominion and nature of Mother., and the relationship is that of the nearest possible equality, between the Mother and the worshipper. Some call this (state) Saarshti साष्र्टी i, e.g., equality of dominion. 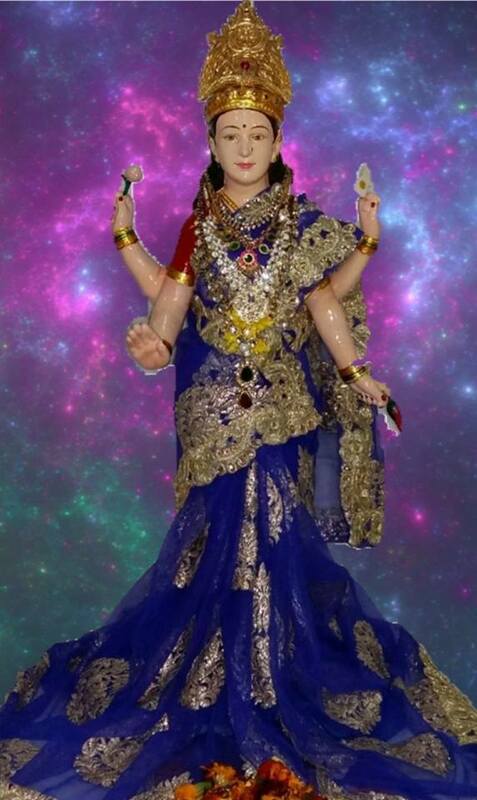 Saamipya सामीप्य is the state of remaining in closest proximity of Mother. This is for them, that worship the deity as residing in their heart. 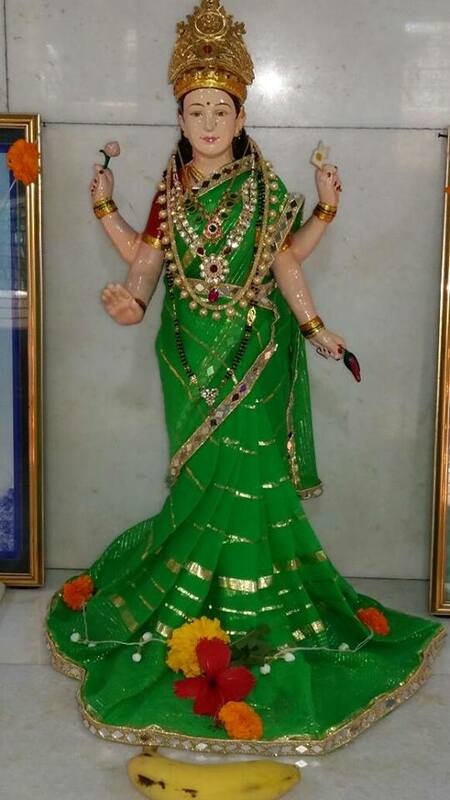 Saayujya सायुज्य is the sate of becoming one with Mother, worshipping oneself as Mother with Mother’s attributes and becoming one with Mother. The higher stage must come in natural course come, after attaining what is to be attained from the lower status. The state or condition of consciousness, in cases of those that attain any of these four kinds of salvation, is the reward of most meritorious actions,character, etc. and the state attained is not perpetual but transitory, and subject to limitations and conditions. 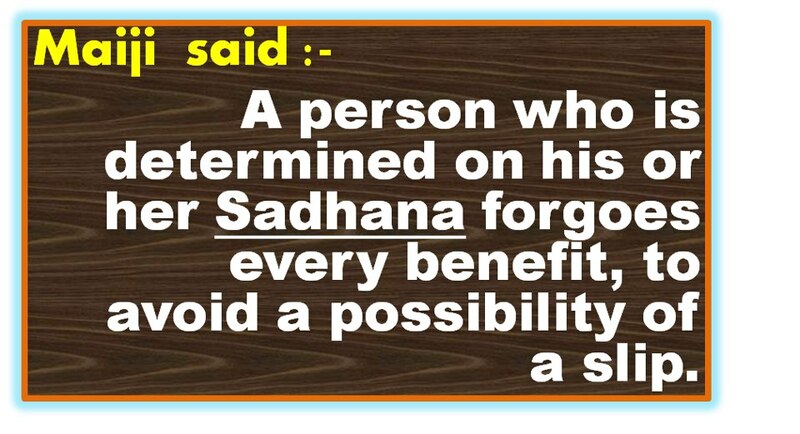 Hence these are described by the words Pada पद (above). The state of Kaivalya कैवल्य salvation on the other hand, is the reward of the realization of oneness and is unconditioned and perpetual and beyond the above said four classes of salvation. Those who perform mechanically meritorious ceremonious and virtuous philanthropic actions , etc., attain the state of salvation above described as Saalokya, Saarupya, Saamipya or Saayujya. 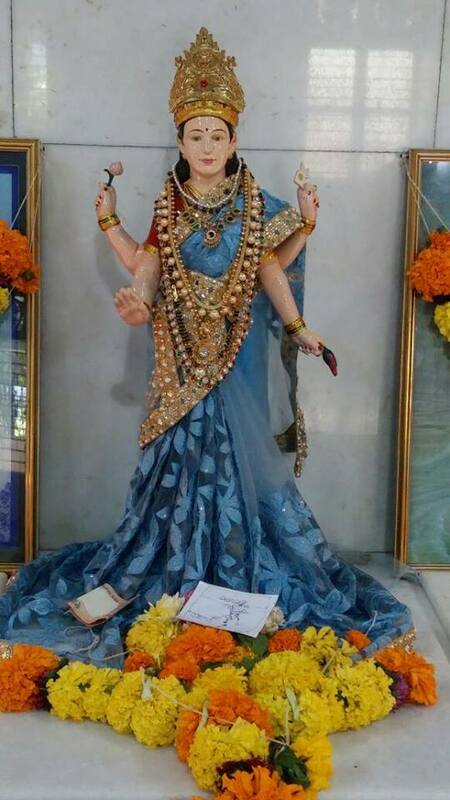 Those who know Mother by realisation, and reject the aforesaid four states of salvation, knowing well that those stages attainable by actions and worships as stated before are imperfect, attain the last state of Kaivalya कैवल्य in full, i.e., the bliss attainable by glory of Mother, and enjoy the unconditional bliss transcending both actions and worships. “The devotee who worship Mother by ceremonies, by images ,by mind, by identification attain the four classes of salvation. After a long experience of these , combined in one, the devotee finally attains the state of salvation known as Kaivalya कैवल्य. Mother is called Tripuraa because She is the Mother of the three entities (Brahmaa, Vishnu and Rudra). There are many triples , e.g., the three Naadis -Sushumnaa,Pingalaa and Idaa; as also Manas, Buddhi and Chitta. Again there are three Devaas, three fires , three energies. Whatever in the world is three fold, is referred to here, as belonging to Her. 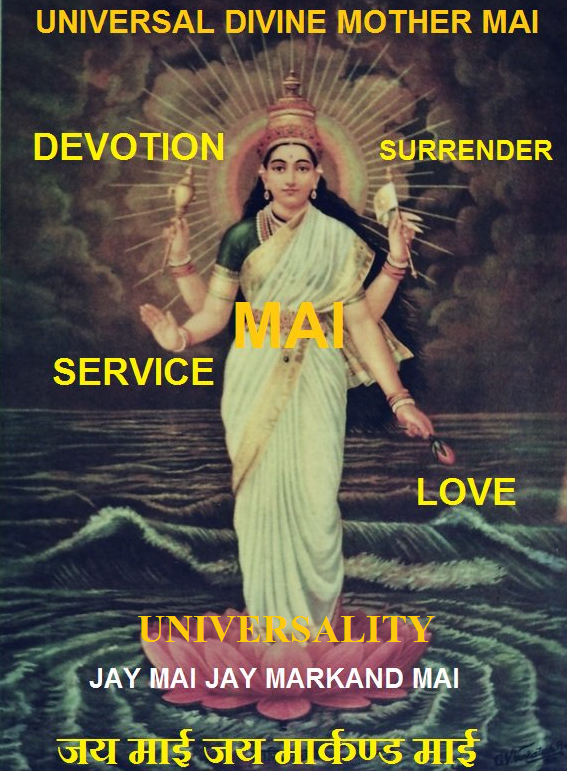 Mai’s White Lotus Feet indicate the pure Samvit, i.e., universal consciousness, which is untainted by any Upaadhis, (obstructive environments), etc. The red feet are the Paraahantaa (Supreme egoism); also known as Mahat being the first emotion(vritti) from the Samvit (universal consciousness). The combined coloured feet indicate atoms of egoism, manifesting themselves, each by modification (the vritti) of ” I ” in individuals. This egoism is known as Ahankaar, which gets nourishment from knowledge, which is imperfect or unreal or perverse, along with all other paraphernalia of emotions, which again owe their existence to ” I “(egoism). Kabir says : The world dies with ” I ” ‘s death. 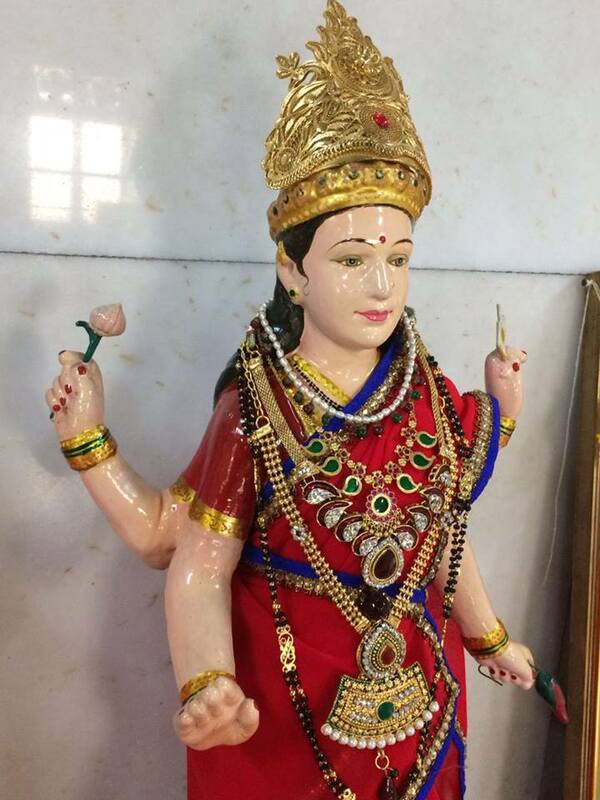 Mother assumes three forms, white, red and black.The supreme energy endowed with Satvic quality, which enables Brahmaa to work is white; the same endowed with Rajasic quality and enabling Vishnu to work is red, the same endowed with Tamasic quality and enabling Rudra to work, is said to be black. the three syllables are the Beejaas of the three divisions (of the Panchadashi Mantra ) , namely, Vaagbhava, Kaamaraaja and Shakti.Vaagishvari is the Jnaana Shakti and confers salvation. 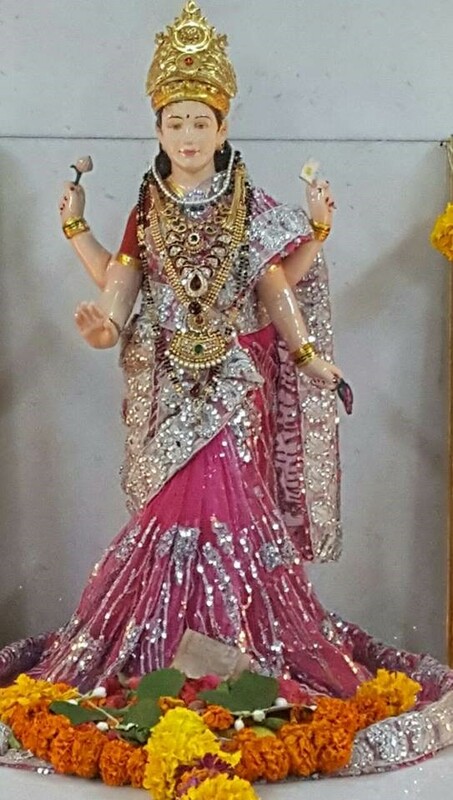 Kaameshvari is the ruler of desires and is the Ichchhaa Shakti. Bhagamaalini is the Kriyaa Shakti, the supreme energy, which is the fulfiller of desires at one end, and the securer of the salvation at the other. Divyagandha is perfume without the perfume-bearing object.When a yogi advances in his practice or a devotee in his devotion he begins to get perfume without any perfuming odours or material objects. By concentration a super-relation is established between the organ of smell and the ether. There are two of many external symptoms by which sometimes devotees and Mother’s favorites are recognised by those whom Mother chooses. One thing is that there is divine perfume around them and another thing is that light around them. In last Easter 1938 when the Founder went to Ahmadabad and was addressing a meeting of devotees for Mother worship, just then he was explaining the terms SUVAASINI सुवासिनी and SUVAASINYARCHANAPREETAA सुवासिन्यर्चनप्रीता such a strong breeze of most attractive perfume was experienced, that sisters began to inquire if any newly arrived ladies had joined them, having returned from a marriage party, in which case there would be the chance of their bringing with them strong scent odours. On inquiry it was found that such was not the source of the Divine Perfume. All that is charming in women proceeds from Mother. According to Hindu Mythology; Shiva’s wife Paarvati is called Umaa because when Umaa’s mother heard of Her determination to undertake most severe penance, refusing to take not only food, but even a fruit or a leaf, to get Shiva as Her husband, Her mother was shocked and shouted out, ” Oh! do not.” U ” उ ” means Oh, and Maa ” मा ” means don’t. Mother residing as fame and brightness in all creations and energy of desire and essence of all mantras, is Umaa the end and essence of Aum. Aum by a slight transposition, of letters , becomes U.M.AA. Umaa is the supreme experience , which destroys the noose of earthly experience , and the best purifier, producing bright mental states and manifestations in so many beneficial forms. 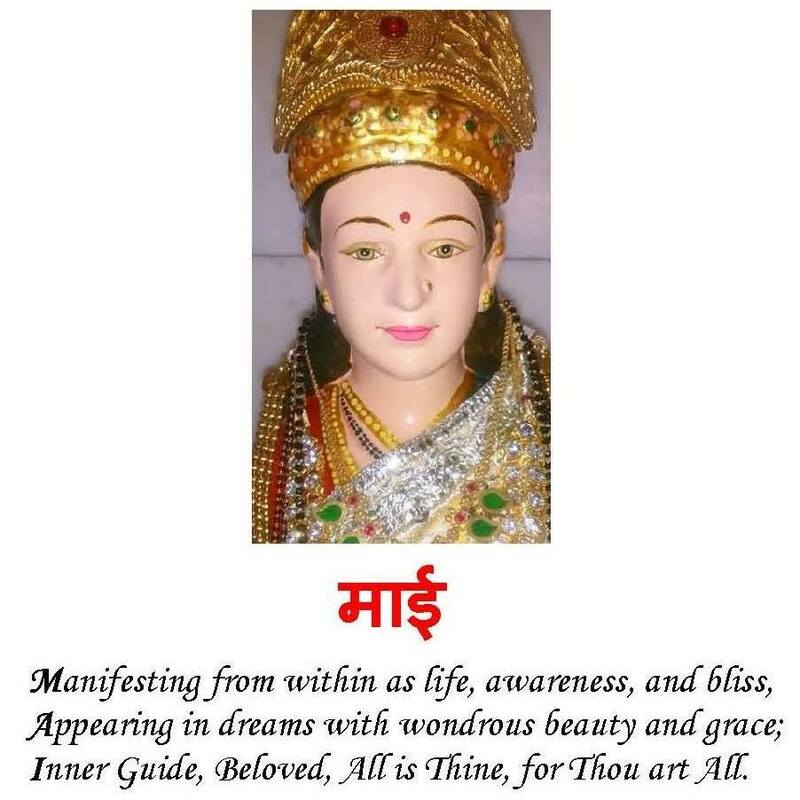 Umaa is the Ichchhaa-Shakti इच्छाशक्ती, the energy of desire. Umaa is golden coloured and through meditation of Umaa, the devotee, a sit were, receives golden currents from Her, which transforms the iron within him and turns him most precious, most dear and most unchangeable, and makes him proof to all atmospheres and degenerating forces. There is a great psychological importance in the fact that She is desire. It is the desire which brings many things into being, maintains many things in position and finally brings salvation. The psychological emotions, which are most important in the matter of hastening evolution are desire, fear, hatred, relationship, love and devotion. All of these automatically bring about meditation and unification. Through the emotion of desire, Mother is attained as a result of various experiences , leading one to conclude that the only thing worthy of being desired , is Mother. Through the emotion of fear, the devotee attains Mother by acting most obediently up to the requirements of scriptures, as a result of the conviction that every waywardness he indulges is seen by Mother and he shall have to answer for all such indulgences. Through the emotions of hatred, the demons gets salvation much quicker than the lukewarm devas, the so-called devotees. But best of all, through the emotion of relationship, Mother is attained by establishing the relationship of yourself with Mother as Her child, however wicked , (please read theory and principles). 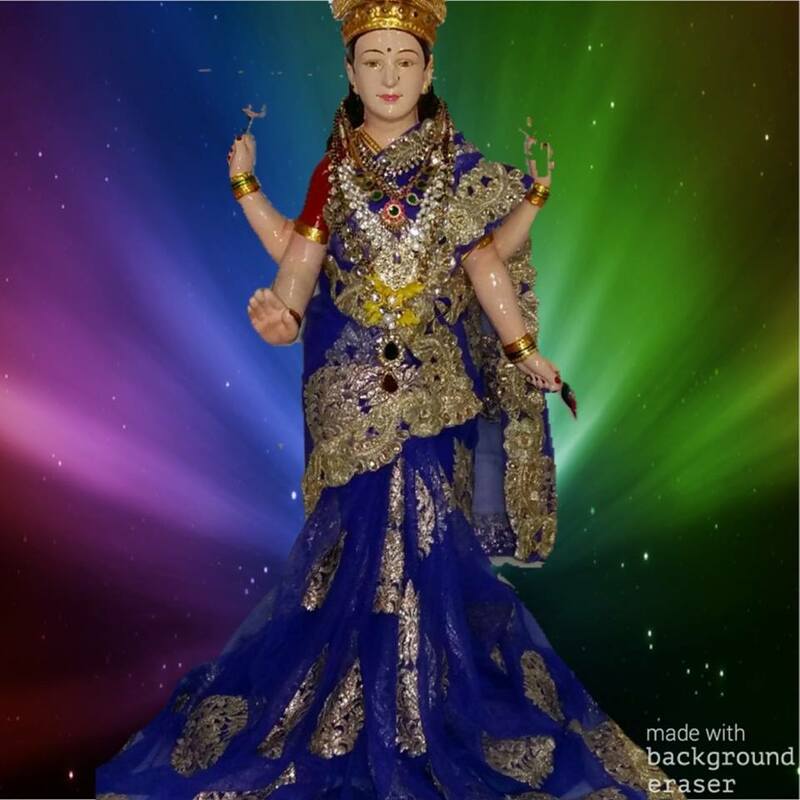 Love and devotion are great sublimating forces, for the attainment of Mother. Speech is classified as Para, Pashyanti, Madhyamaa and Vaikhari, which terms will be discussed hereafter.Goddess of speech is one of the deities , in the octagon referred to before as a figure for meditation, in the Shree Chakra. 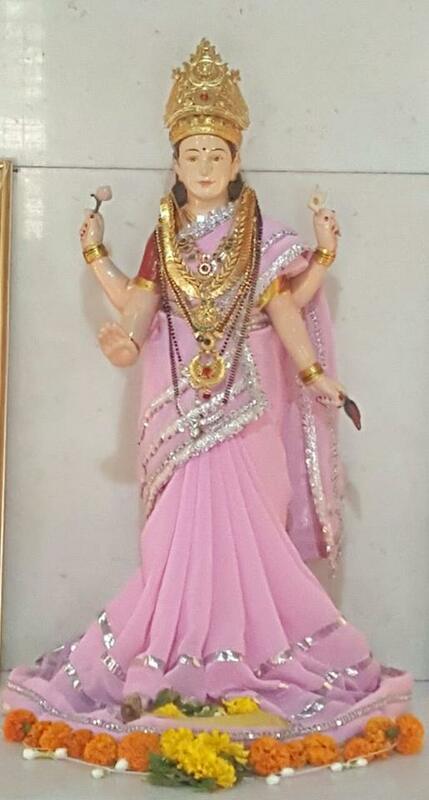 It is a general most common belief, that woman is more inclined towards morality and religion and is nearer God than man, because of her instinctive, emotional and inspiration-receptive nature and spiritualistic sensitivity and evidently as she is less contaminated with the outside life, which often necessitates fair and foul activities and involves succumbing to inevitable evil influences. There is surely a good deal of truth in this belief, and any nation is more truly religious and therefore much happier, where mothers are extremely religious in the true sense of the word. Again, Dara डर means fear, and andolita अन्दोलित means driving out. 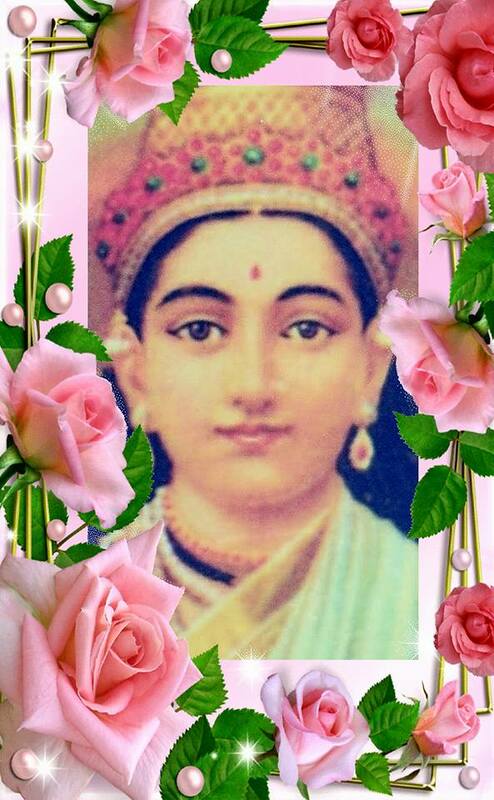 She whose glances dispel the fear of Her devotees. In some cases Mother Herself becomes the Guru. By company of the Guru and by strict obedience to his instructions, you develop virtues and eliminate vices. Mother is the treasure of all virtues. To the extent that you have the treasure of virtues, you have more of Mother with you. Guru also means a rope and Nidhi the person to whom the rope is tied. 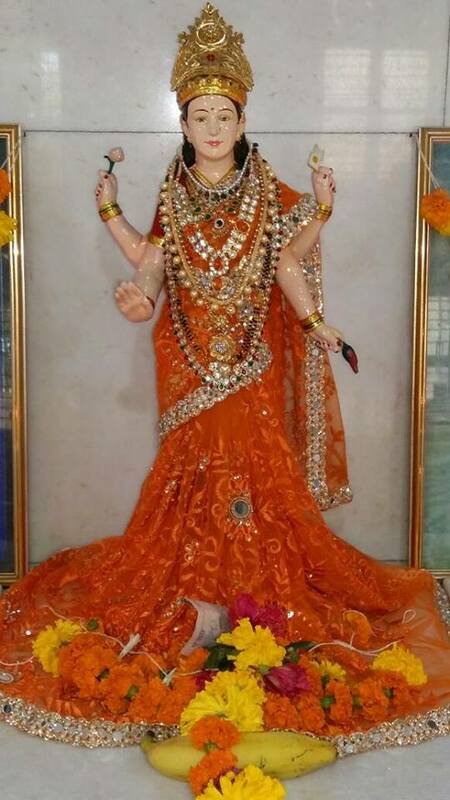 The idea is that during calamities, Mother tightly holds the rope of the boat of Her devotees, preventing them from sinking. 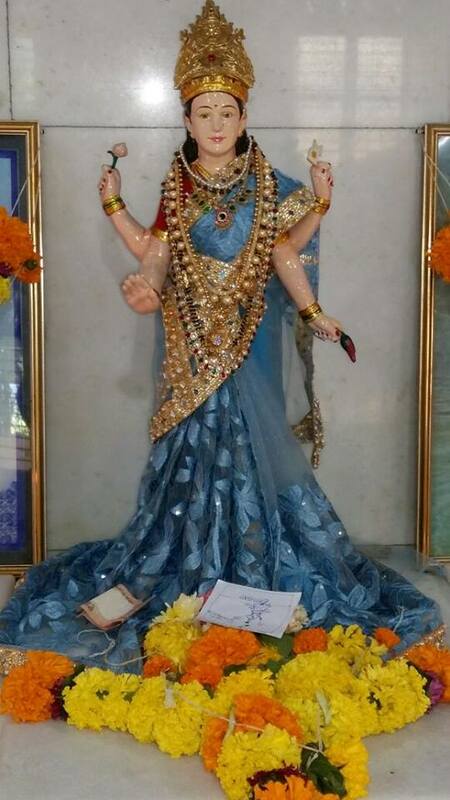 Once Her devotees declare themselves surrendered to Her, She holds them in Her full grip. She is Mother, of whatever appears outside, i.e., Vishva. She is Mother of whatever is felt within, i.e., Indriyaas, as well.She is the Mother of heaven, moon, earth, fire, truth and the evolutionary path, and above all, Mother of the divine cow ( Surabhi), which gives whatever is desired. The word “Go”, means all the above , i.e., Indriyas, heaven, moon, earth, fire, truth, faith, path and Divine Cow. She, that establishes Her devotees or makes them firmly seated, in the path of morality and restraint by chastisement. If necessary and makes them stand like an adamantine rock, ready to suffer any punishment for the sake of their morality and principles. The ether of the heart is Mother. 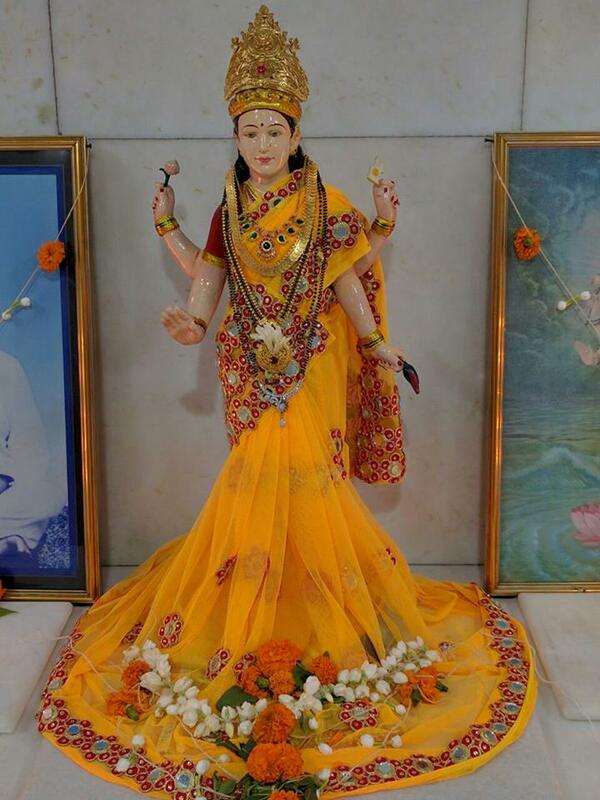 It is here that Mother is worshipped by the higher devotees. In the waking state, there are four Kalaas कला (phases)namely, rising, thinking , and maintaining continuity,and relevancy of mental action.The waking state is said to be the function of Shakti. In the sleeping state, the four Kalaas are death, oblivion,insensibility and sleep abounding with darkness, and these belong to Shiva. In the dreaming state the four Kalaas are desire, confusion, anxiety and recollection of sense objects and these belong to Shiva and Shakti unified. In the Turyaa तुर्या state, the four Kalaas are dispassion, desire of salvation, the mind purified by concentrated meditation (Samadhi समाधी) and determination of reality and unreality; these Kalaas belong to the Finalmost Mother. She inspires Her devotees to give a masterly speech to Her during Her communion with them and She sometimes pampers them with very sweet words Herself. The idea is She enables and teaches Her devotees, how to love, how to address, how to please Her, with masterly speeches, She sports. 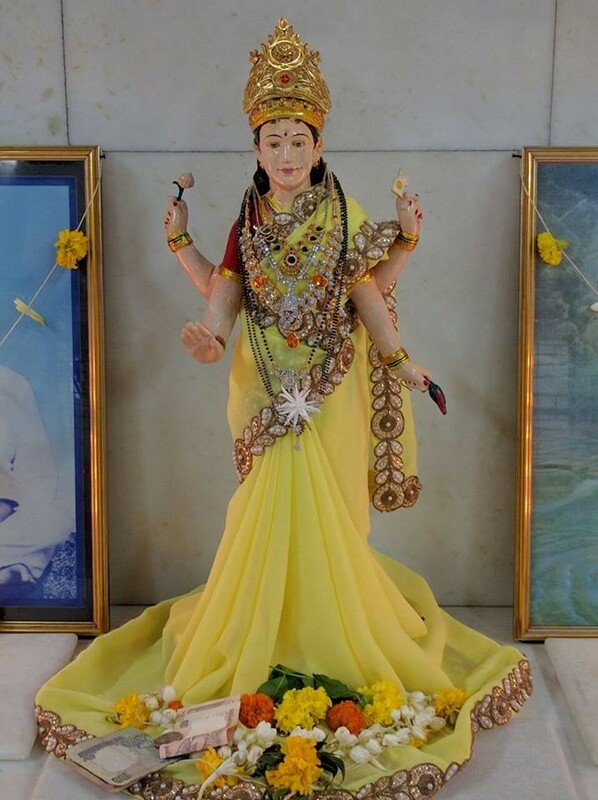 The goddess of Prosperity and Learning never stay together. Usually learned and godliness-goaled souls are poor while rich people are rarely learned. Here however both stay together. A Mother’s devotee can be rich as also learned. 615) Adishaktih आदिशक्तिः –The Primordial energy. As different sparks are to fire, so are all Jevaas( souls) to Mother. Soul or Atmaa is one who obtains , receives and enjoys the objects and exists perpetually. All bodies of embodied souls are the representations of Shakti and all embodied souls are sparks of Shiva. “Penance and knowledge are the means of purifying the soul (Bhutaatman). The knowledge purifies intellect and the soul is said to be on the way to be completely purified on being initiated into the knowledge of the Mother. She is the creator of the universes of all physical, subtle and causal forms. 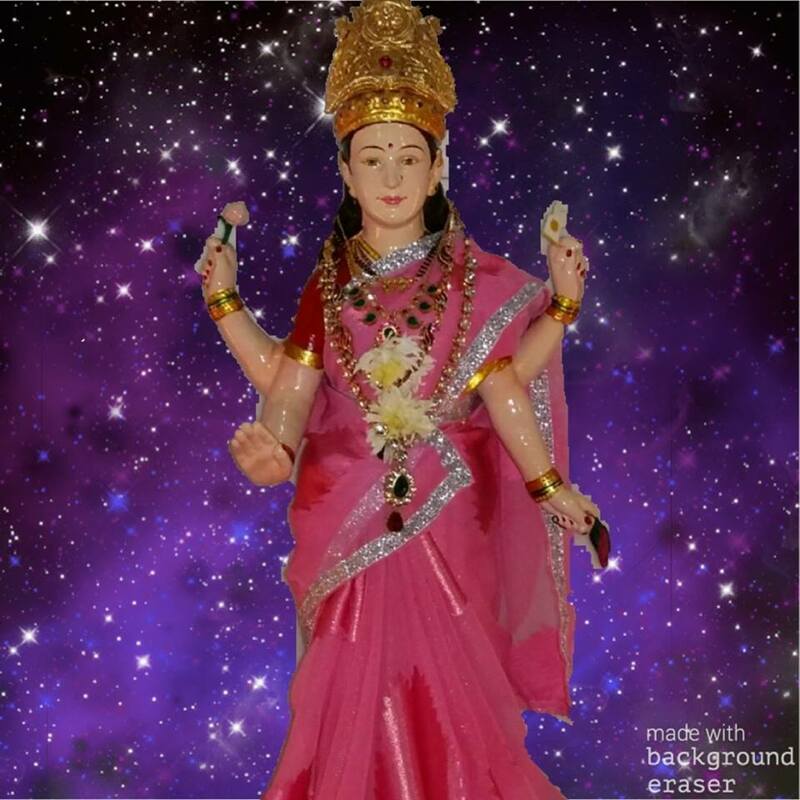 She is the Mother of Viraat, etc., who is the deity of a Brahmaand,i.e., universe. Viraat is the individuality of the collective physical forms ( Sthula sharira ) of the universe, resulting from the combination of the five gross elements, Svaraat is the individuality of the collective subtle forms (Linga-sharira) of the universe. Samraat is the individuality of the collective causal or unmanifested form, which are the causes of the above two ( Karana Sharira).